Direct Fired Thermal Oxidizer with Scrubber – Anguil Environmental Systems, Inc. These devices are also commonly used to promote workplace safety and healthy atmospheric conditions within enclosed spaces. Among the most popular and efficient types of pollution control equipment, scrubbers can remove particles, gasses or chemicals from an air source using one of two types of scrubbers. The two air scrubber subcategories are wet scrubbers, which utilize a liquid solution to attract and remove pollutants, and dry scrubbers, which use a reagent or slurry to trap and dissolve unwanted contaminants. Contaminants can range significantly from the sulfur produced in coal combustion power generation or small fibers that become airborne in textile plants. Laboratories and other such facilities also utilize air scrubbers to remove potentially harmful chemicals from an air source. While scrubbers can be used to remove particulates and chemicals, many are geared specifically towards one or the other as optimal operating conditions differ and chemical solutions and absorption techniques are often tailored to specific contaminants. Improperly configured or poorly maintained air scrubbers can leave harmful VOCs and HOCs in the atmosphere. For this reason, the EPA and other organizations encourage and even require the use of air scrubbers or other such equipment. As aforementioned, most air scrubbers can be divided into one of two categories. Wet scrubbers function forcing contaminated air through a spray or pool of cleaning solution. Particulates and gasses are attracted to the specialized solution, so as the air flow passes they are trapped and collect in a receptacle with the liquid cleanser. 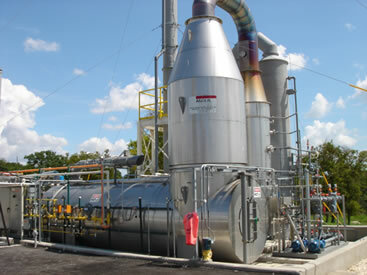 Dry scrubbers operate in a similar fashion, though minimal moisture, if any, is used to attract and collect pollutants. Instead, this method involves the application of a dry reagent or slurry which is introduced into a dirty exhaust stream. The chemicals in this slurry, often limestone, attract chemicals and particulates which form larger particles. The gas flow is then forced through one or more filters which collect the contaminants which, without the reaction or attraction, would be small enough to pass through the filter. Chemical solutions may be used in both wet and dry scrubbers to sort out pollutants. Additional filters can be added as well for increased efficiency. Pre-filters are employed prior to the gas reaching the scrubber and collect larger pollutants, allowing the apparatus to focus on smaller particulates. Final filters may also be used at the exhaust end to ensure no contaminants pass through the scrubber. Qualified air pollution control professionals can evaluate an area and air supply and suggest the proper size and level of complexity needed for optimal performance in a specific application. Air Scrubbers Air scrubbers are emission control systems implicated in a broad range of industrial and commercial applications to purify process air streams.